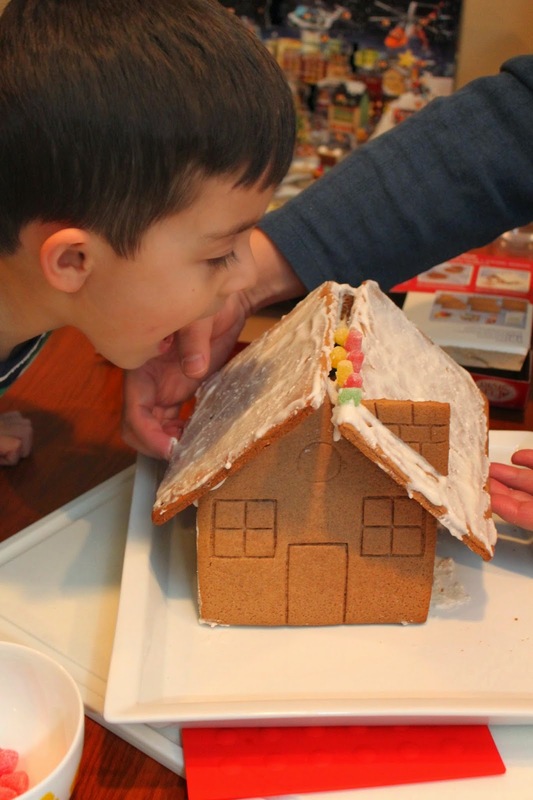 Before I write about our Gingerbread House experience (get ready to laugh!) - can I brag for a moment? Brian and I have been planning his birthday party lately, and he is just breaking my heart. In all the best ways. This is his first big birthday party. He's had parties at our house with a few friends or family members over the years, but this is the first one that we're having outside the home. And it's a big one - his entire class was invited! Brian has been asking for a piñata all year, so that was number one on our list after choosing the venue (Bounce U!). Lucky for us, they allow "pull string" piñatas! But then Brian was concerned that not everyone would have a string to pull. And then he was concerned that the girls would feel left out with a "boy piñata. 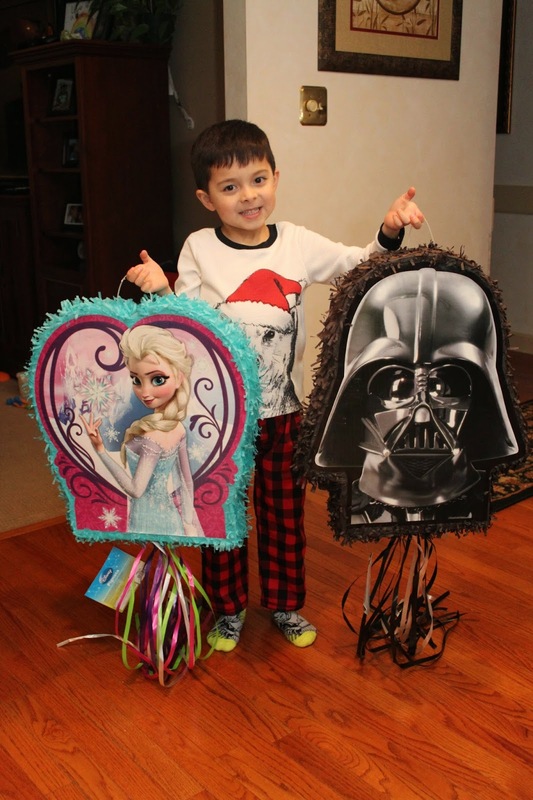 So the other day we went to "Party City" to see what they offered and after selecting a Darth Vader piñata - he carefully chose a Frozen one for the girls. Every day he travels back and forth to school on the bus with a notepad and pencil. He loves to write little notes to his friends, draw pictures or just practice writing. He wanted all of his friends to have a notepad and pencil, too! The girls will have little flowered notepads and Hello Kitty pencils... and the boys will get sports themed notepad and pencils. Oh boy - spoiler alert if you're a classmate of Brian's! Whoopsie! Ha! Maybe it seems a little kookie that it's going to be a Star Wars, Frozen, Hello Kitty, Sports Themed Bouncing party... but that's not the theme, anyway. Apparently, the theme of Brian's birthday party is love. He chose every detail with love. And who am I to argue with that?? 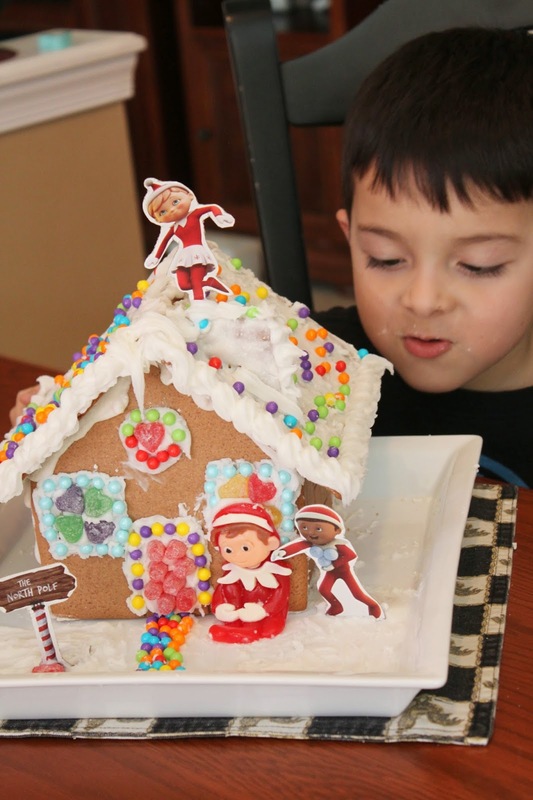 Saturday afternoon we spent time as a family making our Gingerbread House! 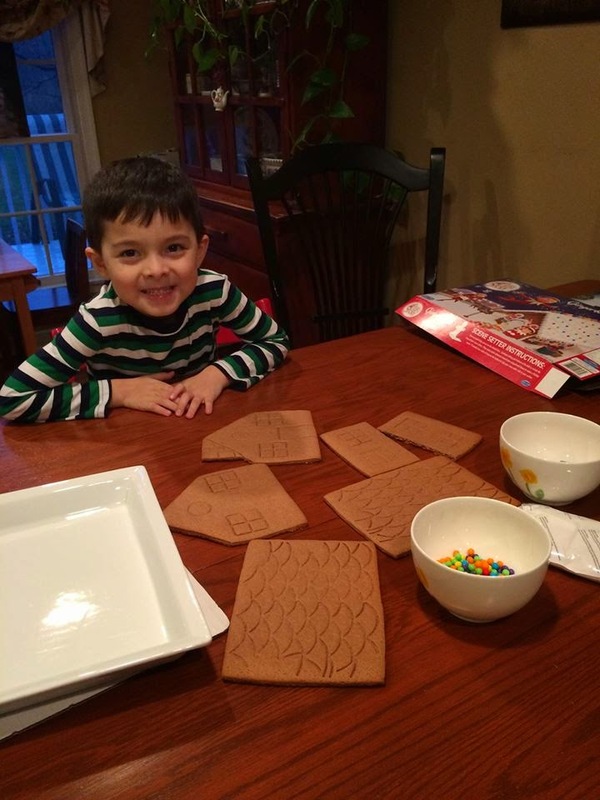 Brian chose the "Elf on the Shelf" kit, which looked adorable and easy enough! "Spread the icing in a strip along the edges and hold for one minute until it sets." 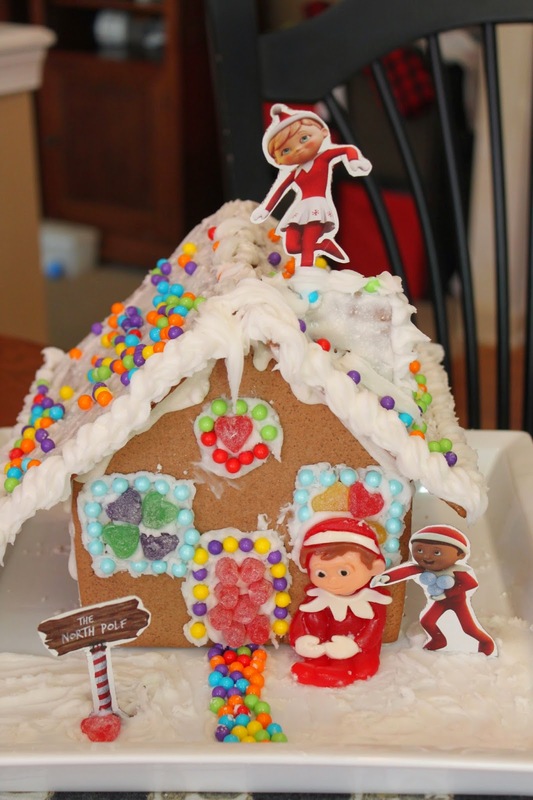 "Use a thicker strip of icing along the roof and hold in place for one minute." Ok - so far, so good! Until it started to slip. At first, Brian and Ed were ready to give up. "Let's just eat it now!" Ed came up with a brilliant plan to hold the roof in place with toothpicks until it set - or forever. Whichever came first. We let it sit overnight and thought we would tackle it again in the morning after we went to the grocery story to get more icing. Brian and I kind of ate a lot of the icing along the way. Not at all ashamed to admit that. Desperate times called for sugar. This afternoon we completed the house! I'm pretty sure this is our best house yet. I don't think this house has a long future here. I'm not sure I trust our resident Gingerbread Man. He is such a loving child. I love his ideas for his birthday. 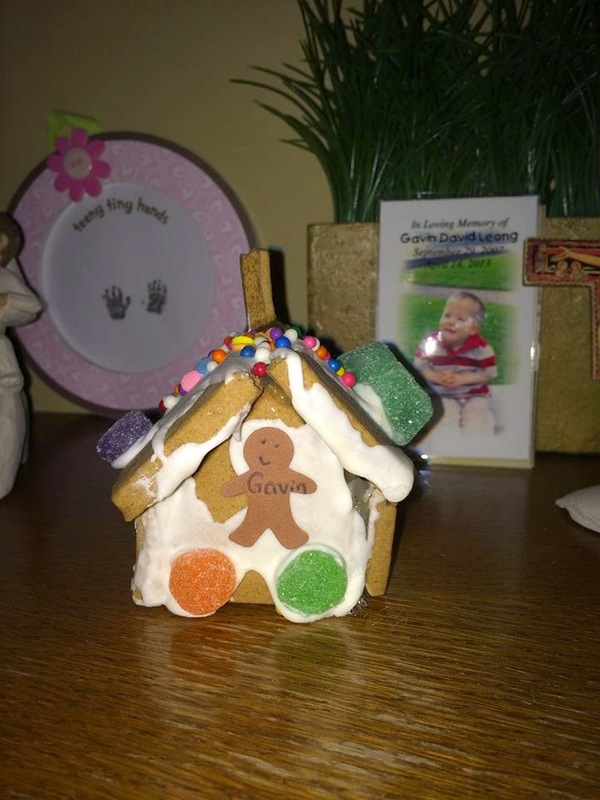 His house turned out so good.. Good for dad saving the day with toothpicks. You have an amazing son. I think he will probably eat the house too. Oh well, it is made for that after all.